Apex Supply Chain Technologies can help you increase safety, manage and document compliance and grow your bottom line through point-of-work industrial vending solutions. Apex is the worldwide leader in automated vending, utilised by over 6,500 companies, including 250+ in the Fortune 1000. Apex solutions can manage any supplies, tools or equipment that need to be tracked and controlled. Employees can focus on uninterrupted productivity, while Apex’s enterprise software manages item usage, inventory levels and reordering. You will save money by eliminating waste and misuse of supplies and equipment. Best of all, Apex solutions are easy to use, easy to implement and easy to afford. Protect your employees and your bottom line with proven industrial vending solutions that help you dispense critical supplies and tools. Prove compliance and grow your output by making sure your people and the machines they use have what they need. Stay safe and avoid costly delays by ensuring you have exactly what you need, when and where you need it, for only those who need it. Until fairly recently, vending machines were cost-prohibitive for product suppliers and users. However, that has all changed. New low price levels have been made possible through the incorporation of innovative software technology into the vending machines which provide real-time data to users and have made installation far simpler. This combined with rapidly increasing customer demand for point-of-work technology, means that not just industrial companies but also suppliers are now seeing both the economic and the competitive advantage of utilising vending technology. 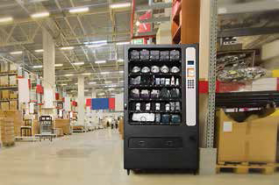 But the benefit is not just for the user, suppliers can also benefit from the use of vending technology. Vending is often a lead-in to additional business for a supplier. Often suppliers that provide vending technologies can enter into accounts where previously there was only infrequent business and greatly increase their presence due to the benefits presented through vending. Apex Supply Chain Technologies offers a range of supply/material vending solutions with the Edge 5000 being one of the most popular. 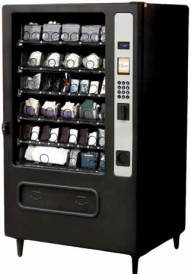 The upright vending machine is generally filled with commonly used parts or equipment and housed close to the point-of-work. Parts stored in the machine are accessed using either an identity card or unique pin which allows managers to trace individual workers usage. The Apex machines are connected to an online reporting system via Apex’s Connect n’ Go Technology meaning that fitting the machines is simple and requires only an internet connection to install. With the help of Apex Supply Chain Technologies, has sourced a number of case studies from companies utilising point-of-work vending technology to great effect. Read on to hear how they have used the vending machines to eliminate waiting time, product overuse and help productivity. Constellium designs and manufactures aluminium products and components for a large range of industries from construction to aerospace. With a considerable health and safety equipment (HSE) requirement intrinsic in its operation, Constellium wanted to implement an automated system to ensure the right equipment was being used by the right person for the right task as well as to reduce unnecessary wastage. At its US-based plant in Ravenswood, West Virginia, Constellium turned to Apex Supply Chain Technologies for an industrial vending solution that could generate reports in real-time, or automatically at prescheduled times, complete with real-time usage, inventory, and restocking information. After installing four Apex Edge 5000 vending machines, they quickly saw considerable cost savings. “The first four averaged savings of £349 per machine per month,” said Purchasing Agent Jennifer Fife, of the amount of spend saved by the reduction of use of PPE including safety vests, safety glasses, and gloves. That’s a savings of £16,743 each year for just those four machines. “And that’s with them not fully stocked,” said Fife, adding that Constellium is planning to stock the machines with mill supplies in addition to the PPE products. Since implementing the first four machines as part of a pilot program at the Ravenswood mill, 10 more Edge 5000 machines have been placed near the point-of use throughout the plant. Constellium plans to install about 18 total Edge 5000’s at the facility. Based on the £349 savings per month per machine, the results represent a potential cost saving of more than £74,824 annually. PepsiCo’s Quaker Oats division Gatorade plant in Indianapolis was facing inefficiencies in usage of personal protection equipment. Management knew that much more was being used than necessary, driving up PPE spend while lowering productivity. PPE distribution and use was a “free-for-all” with little tracking, accountability, and control, said Health, Safety and Environment Manager Derek Janquart. One of the plant’s industrial distributors considered several solutions but eventually chose Apex’s next-generation technology Edge 5000 point-of-work machines. The Edge 5000 with Apex’s Trajectory Enterprise Technology Platform now automatically tracks, manages, and controls vended items, and Janquart can see and track usage anytime, anywhere from his web browser. “It’s worked so well that it’s not even a cost we pay attention to anymore,” Janquart said. The introduction of vending machines has saved Pfizer hundreds of thousands of dollars in downtime, inventory, and overall costs at its plants in Pearl River, New York, and in Guayama, Puerto Rico. And point-of-work vended dispensing is a cornerstone of those efficiencies. The Pearl River facility is spread over 550 acres with about 4,000 people working there. However, prior to the introduction of Apex Edge vending productions, the process for performing minor maintenance tasks was extremely time consuming. Sometimes the worker wouldn’t even find the needed part, and the downtime due to the lack of one part could stretch into several hours. If the worker did locate the part, they would then have to take it back down to the second floor, re-gown, return to the workstation, install the part and finally be up and running. Total labour and production time lost during the above process was estimated to be at least an hour-and-a-half. And that’s only if the employee retrieved the correct part; if not, they would have to go through the entire process again. The Solution: multiple Edge 5000 machines, supplied in the UK by Apex Supply Chain Technologies. The vending machines now supply the frequently needed parts at the point-of-work, eliminating the need for employees to go through the gruelling, time-consuming process detailed above. In addition, due to the live reporting and stocktaking functionality, the company enjoys the added benefit of eliminating out of stock situations and reducing orders. An employee simply goes to the machine (without de-gowning/re-gowning), swipes his badge, dispenses the part, and is up and running within minutes. The most recent monthly tracking figures provided by the Edge 5000 – with technology by Apex Supply Chain Technologies – show that, Pfizer saved an estimated £8,600 in labour costs over a single month thanks to point-of-work dispensing. Pfizer also added two lockers to another machine to dispense larger parts such as roll wheels. Overall, the plant is so pleased with the Edge 5000s and lockers that the potential exists for many more machines and lockers throughout the enormous Pfizer plant.